Although hot air ballooning is a truly impressive experience, we decided to take it to the next level. The Balloon Adventures experience is so much more than just a hot air balloon ride. With the world’s only falconry from the sky performance and riding in vintage Land Rovers through the desert, we give you the complete ‘wow’ experience (and don’t just claim to!). This is the ultimate desert adventure complete with a lavish breakfast spread in an authentic Heritage camp nestled in a Royal desert retreat. 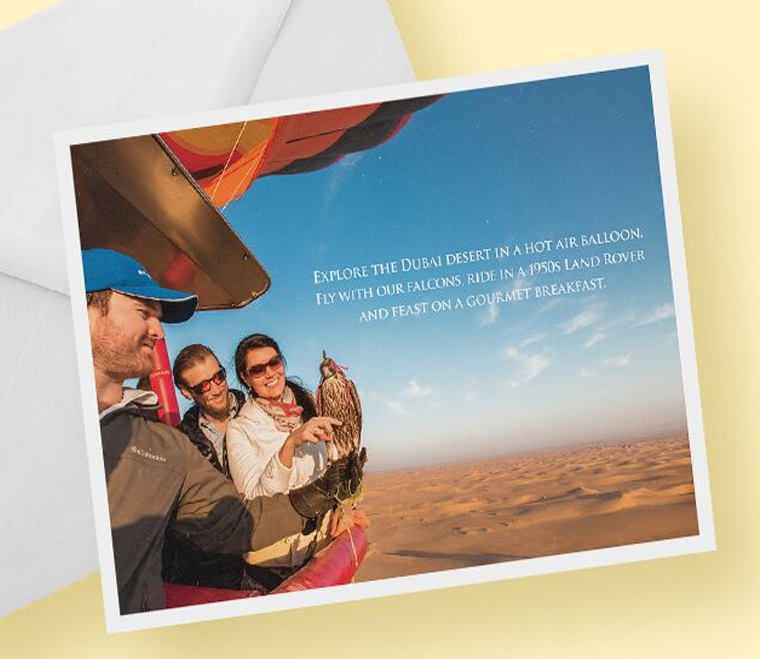 After an unforgettable morning in a magical setting in the desert, you’ll return to Dubai with your appetite for adventure (and breakfast) fully satisfied! Before the sun rises we will pick you up from your hotel to travel to the take-off point in the desert – not more than a 45-minute drive from the city. As you arrive, the ground crew will be preparing the balloon envelopes and baskets. After a quick safety briefing, you will gather around your basket while your Pilot begins the thrilling process of inflation. You will climb into the basket and before you know it, you will begin to peacefully float off the ground and ascend into the sky. As you float up in the sky, the hues along the horizon begin to transform into beautiful shades of yellows and oranges. Depending on which direction you are facing, you will see the Arabian sun rising behind the Hajar mountains over the desert dunes. 4,000ft in the sky is one of the best places in the world to witness the beauty of the sunrise. Look out for Arabian oryx, gazelles or wandering camels in the sand dunes below. Every balloon flight is approximately 1 hour long. 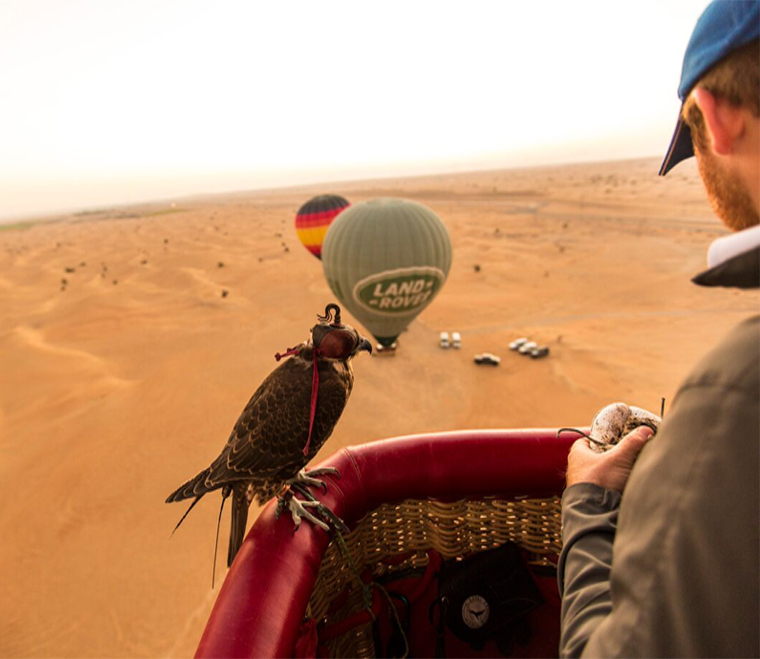 A falconer goes up with every balloon flight. 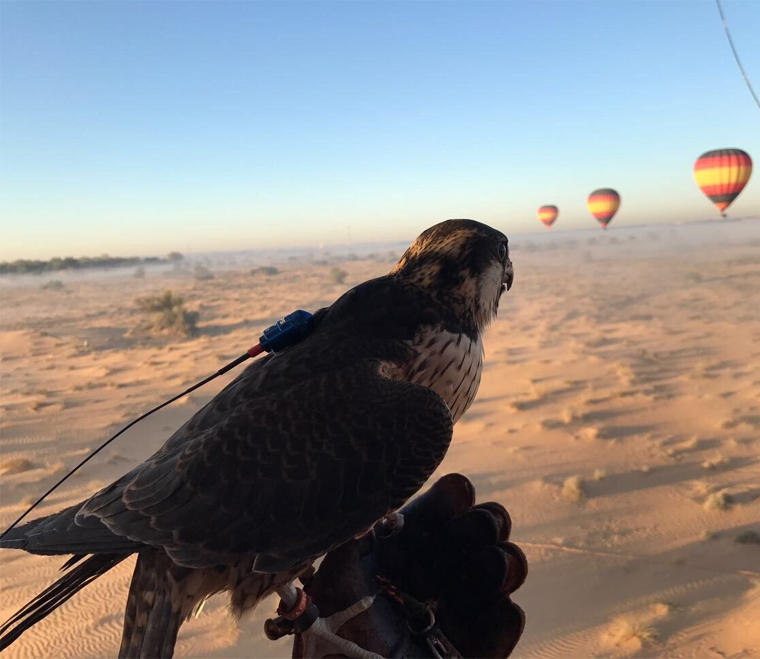 At the optimal time, the falcon will be released from the hot air balloon to demonstrate their speed and agility by swooping below, above and around the hot air balloons. This is the only place in the world where you will get to experience this one-of-a-kind falcon show from the sky! The balloons land somewhere different in the desert everyday depending on the wind. Everyone will attach the clips of their belts to the basket and embrace the landing position a few minutes before the balloon touches the ground. After landing, the Pilot will let you know when it’s the right time to climb out the basket. Watch as the other balloons land and how the ground crew professionally roll up the balloon envelope. Also get a chance to hold and get photographs with the falcon you shared the skies and basket with. The adventure doesn’t end there! After your once-in-a-lifetime experience of the desert from up above, get ready to travel through the dunes in vintage Land Rovers to an authentic Heritage camp in a Royal desert retreat. These 1950’s Land Rovers were the first motorised vehicles introduced to the desert and have been resorted to their former glory. New adventures always work up an appetite! Arrive at an authentic Heritage camp to enjoy a 5-star breakfast in the heart of the desert. Relax in this beautiful setting and enjoy a delicious spread of eggs Benedict, shakshuka, salmon, caviar, halloumi cheese, fresh fruit, cold cut platters and more. Before heading back to the city, explore the authentic camp built out of natural materials like stone, wood and goat hair or sit back and relax in the traditional majlis. When you are ready your driver will take you back to the city.